Having cut itself from the rest of the world until the late 19th century, Japan has preserved many of its traditional customs, though western influences continue to grow. Many of these customs are closely linked with the changing of the seasons, with traditional religious practices and festivals, and with maintaining the bonds between families, friends and business associates. The giving of gifts forms a major part of Japanese social culture and affects all aspects of life. The most important aspect of gift giving in Japan is the practice of giving monetary gifts on occasions of celebration, such as births, weddings and graduations. Cash gifts are placed in a special envelope, known as a shūgibukuro (祝儀袋) and given directly, or in the case of a wedding, placed in a communal gift area. When a friend or coworker has suffered a loss in the family, a similar monetary gift known as okōden (お香典) is given. It is common, especially in the case of okōden, for the recipient to give something back to everyone they received gifts from. 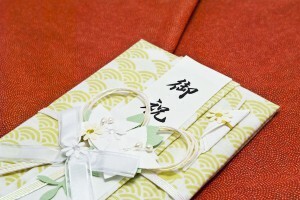 The value of these return gifts, known as okaeshi (お返し), is often around 40-50% of the amount received. 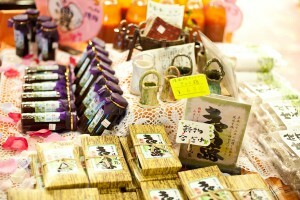 Omiyage (お土産, souvenirs), usually food specialties from the region visited, are often brought back from trips and given to family, friends, and co-workers. Individually-wrapped cakes and other confectionery in decorative packaging are sold as omiyage in vast quantities at train stations, airports, rest stations, and tourist shops. It is also common to bring a small gift such as sweets when visiting a person’s house. Gift giving at the end of the year and in the middle of summer is a way of maintaining friendly relationships and is particularly common in the business world. Oseibo (お歳暮) is the name for gifts given in the period before businesses close for the New Year holidays, while ochūgen (お中元) refers to gifts given around the 15th July. Gift boxes of confectionery or drinks (including alcohol) are sold at department stores and given by companies to their professional partners and customers, to thank them for their business and wish for their continued cooperation. Originally a Western Christian festival and more recently a secular celebration of love and relationships, Valentine’s Day (14th February) has taken on its own unique flavour in Japan. While in western countries it is traditional for a man to buy gifts for his wife or lover, and in modern times for couples to buy each other gifts, in Japan it is a day for girls to give gifts of chocolate. Chocolates are often “made” at home (by melting and shaping chocolate blocks) and given to boys. It is common for girls to also give chocolates to friends and even to people they don’t particularly like, so no one feels left out. In 1978, the Japanese Confectionery Industry began the custom of “White Day” – marking the 14th March as a day for men to buy gifts for the women they received Valentines from. White chocolates are common White Day gifts, but other items are also popular. New Year is the most important holiday in the Japanese calendar, and has a number of traditions and customs associated with it. Hatsumōde (初詣) is the term given to the first shrine visit of the year. Most individuals will visit a shrine or temple within the first three days of the year as these are public holidays. 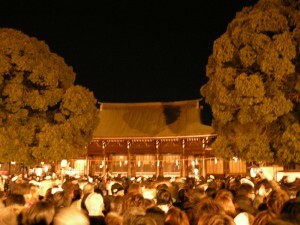 It is very common to do hatsumōde soon after midnight on New Year’s morning, and many people line up for hours at major shrines to make a short prayer for good health and fortune. Protective charms (お守り, omamori) and written predictions (おみくじ, omikuji) for the coming year are sold at the shrine. Similar to the western custom of sending Christmas cards, in Japan individuals and businesses send New Year’s cards, known as nengajō (年賀状) to friends, family and customers. Nengajō are usually postcards of standard size and are often decorated with images of the animal of the Chinese zodiac for the coming year (though Chinese New Year does not fall until later in January or February). As families may send upwards of a hundred of these each year, it is not uncommon for them to be printed rather than handwritten. Some nengajō come with lottery numbers, so recipients can claim a prize if one of their numbers is drawn. It is considered bad form to neglect to send a card to someone who sent one to you. In these cases it is common to send a belated greeting soon after New Year asking after their wellbeing. While it is common to eat soba noodles on New Year’s Eve, the focus of New Year’s food celebration is on osechi (おせち). 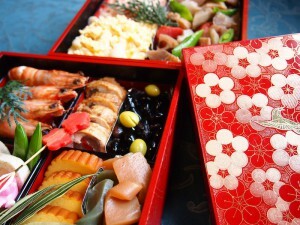 Osechi is food presented in typically square boxes, with items arranged in a decorative fashion. More elaborate osechi boxes have large numbers of compartments and follow traditional guidelines about the arrangement of particular kinds of food, but those prepared by households are generally simpler. Osechi boxes are designed to stack neatly for easy storage. Customs associated with death in Japan differ greatly from those found in the West, and are typically carried out in accordance with Buddhist beliefs. In Japan, a ceremony similar to a wake is typically held before the funeral proper. It is common for close relatives to hold an overnight vigil with the deceased following the wake. Cremations carried out in accordance with Buddhist customs are the most common type of ceremony, attended by family and friends. Afterwards, family members gather the bones with chopsticks and place them in an urn, to be interred in a family grave. Mourning rituals may depend on regional and familial traditions. Mourning ceremonies on the seventh day and the 49th day after a death are common. Services for the dead are also given during obon (お盆), the late-summer festival associated with death. Visiting the family grave, known as ohaka-mairi (お墓参り) is a common ritual that may be carried out once or twice a year. Family members clean up the area around the grave and offer a prayer to their ancestors. Flowers may be left as an offering. Usually, close family members of the deceased will not send or receive New Year’s cards in the first year following the death. If cards are received from people unaware of the death, a mochū-hagaki (喪中はがき, mourning card) notifying them of the loss may be sent. Although you can usually use your signature, circumstances such as obtaining a loan or signing a contract may require a Hanko or Inkan (personal signature seal) which can be made at specialty shops or at stores like Tokyu Hands. On some occasions, an inkan-shomei (印鑑証明, seal certificate) is required to certify that the seal has been officially registered with the municipality.